In order to do this correctly I have to give a short history of Father. When he was in his early teens he hunted, fished and trapped with his Great Uncle Henry Prosser. Father would tell about them hopping a frieght train and then jumping off when they got to the place where they were going to hunt, fish or trap for the next few weeks or a month. 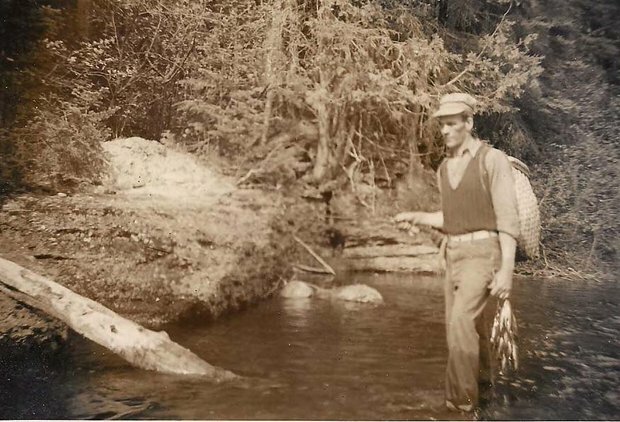 Under the tutelage of Great Uncle, Father became an excellent woodsman. A short story as an example of his early years...In those days a guest was always invited to join in on the meal. Just before noon the local game warden walked up the driveway and was promptly invited to join in on the midday meal...His mother sat a large roast in the center of the table...Yes, a deer roastand a month before hunting season The meal was enjoyed by all. After dessert was consumed the warden asked my Grandfather who was his meat man. Grandfather pointed to Father. The warden then told Father to be sure to bury the hide and hooves. After WW2 Father came home and took over the small farm. Mother came over from England and they got married and settled in. It was a small mixed farm and Father did not have a lot of time to hunt/fish after that.. He managed to sneak away on Sundays and always guided for a few weeks in hunting season...I think mostly for his love of the woods ...But the extra few dollars came in handy as well. 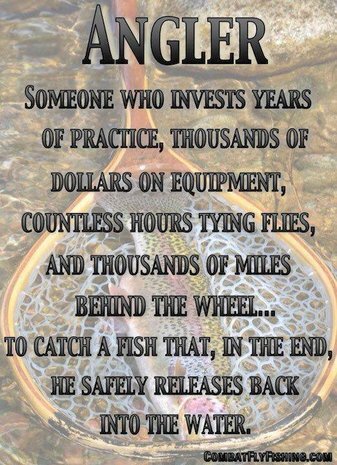 In all truths, it was my mother who introduced me to fishing.I was not very old as I had not yet started school. Father was cutting a few trees on the woodlot and Mother and I walked out to see him. There was a small stream close by...I mean small..about 3 feet across. But it had some cute little pools and these had trout in them...Mother rigged me up with an alder stick, line, hook, sinker and worm..I don't remember even hooking a fish...But it was enough to hook me for life. About the age of ten, Father took me out the trail to a larger stream that passed throug our woodlot..The fishing was great and now I knew the trail...I was off to the races then...That occupied me for several years...One Sunday i went to Sunday school and the teacher wanted to know why I was absent the previous Sunday...I told her the truth...That I had gone fishing..She then wanted to know if I was going to let fishing interfere with my Sunday school...I promptly told her that Sunday school would not interfere with my fishing any more..And never went back to Sunday school again. 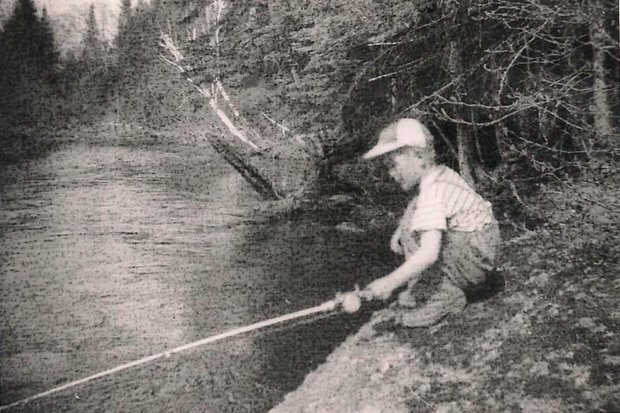 About then Father used to go exploring with a fishing buddy in the headwaters of the Miramichi...Always looking for large brookies. These trips were usually 3 day affairs and covered a lot of miles on foot. After several years of exploring he settled in to a couple of locations. These were about a 7 mile hike one way. When I was about twelve I was invited to go along..It was with some trepitation though...Not certain if I could walk that far. Father packed my stuff along with his and carried it all. It truly was great fishing...The ground rules were simple...If it wasn't a foot long or you weren't going to eat it..Let it go. We crossed a beaver dam on the way in..I tossed a hook in and promptly hooked a 14 inch trout..Father gently landed it, proceeded to take the hook out. Held it at arms length over the water and said "Oops, I dropped it." I was crestfallen, but soon came to realize that it would not have lasted the 3 days until I got it home.On the way back I was always running ahead and pushing over dead snags...When we got home Father then proceeded to make me a pack basket. From then on I had to carry my own gear.